We are collecting gifts for the residents of Dominion Village at Williamsburg at the Southern Living Showcase Home (109 Ford's Colony Drive) on Dec. 3rd, 4th, 10th, and 11th from 1-4pm. Bring your new, unwrapped gift to the house and our team will wrap and label the gifts. You can also bring your gifts to our New Town office (5350 Discovery Park Blvd.) Mon.- Fri., 9-5pm. 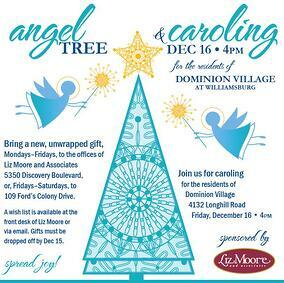 Join us for caroling at Dominion Village on Friday, December 16th at 4pm. Let us know if you'd like to participate! Dominion Village at Williamsburg offers Assisted Living, Memory Care - Alzheimer's/Dementia, Respite Care, and Short Term Stays. Their residents enjoy many senior living services and amenities, including restaurant-style dining, highly skilled 24-hour staff, a full slate of social, educational, and recreational activities, exercise and wellness programs, full-service beauty salon and barber shop, games room, wireless Internet, library, laundry and housekeeping.